The next thing I had on my calendar in February was a trip to Alabama to celebrate someone's first birthday! When the trip to Beersheba Springs was announced in the fall, I immediately texted my sister to see if the party would be the weekend before or after his birthday. I didn't want to miss either the trip OR the party. 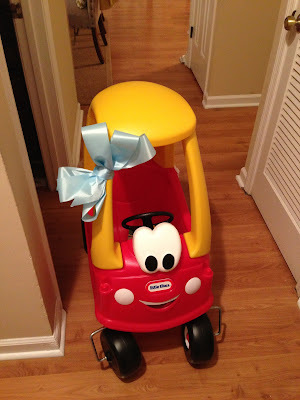 Super Aunt had known since Christmas what I wanted to get him: a Cozy Coupe. Everyone knows how cute these things are but what no one tells you is how hard they are to assemble. It took me two nights and I had to use my cordless drill, a screwdriver and a hammer. But it was ALL worth it after I tied a cute bow on it, put it in my trunk, drove it to Alabama, snuck it in the house when no one was looking, pulled it out the end of the party and saw my nephew's delight. He scooted right over to it and played in it a good bit that day and every day since, from what I am told. The party was fun and he was a total angel, of course. I also made him a board book from Pint Size Productions, with pictures from his first year. He just can't read it while he's behind the wheel of his car. I can't believe that he is a year old. He's my favorite person on the planet and he has absolutely no idea. What a doll. Bitty boy, your Aunt Nin loves you very much! I got my niece the same thing for her first birthday and it took me and her daddy about 4 hours to put together. Crazy!! My favorite pictures from my trip to see her for her party are in that little car!